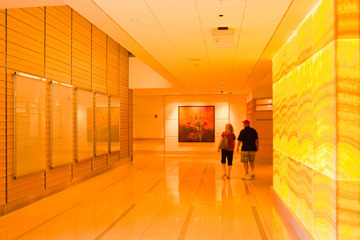 Smilow Cancer Hospital treats more cancer patients than any other hospital in Connecticut. A team from one of Smilow's 13 cancer programs is available to discuss each patient's diagnosis and therapy options. This results in the development of a unique, comprehensive treatment plan for each patient that can include surgery, medical oncology, radiation oncology, a combination of treatments or conservative monitoring. Smilow Cancer Hospital is a leader in personalized cancer care through innovative tumor profiling techniques used to analyze every patient's cancer. At Smilow Cancer Hospital, we are committed to making sure that each patient has an outstanding and positive cancer care experience; and to a steadfast focus on patient- and family-centered care. We offer the latest in screening and diagnosis, genetic counseling, treatment, psychosocial support, pain management, rehabilitation and long-term, follow-up care. Building on the scientific traditions of Yale University, we are dedicated to interdisciplinary cancer research in basic science, translational research and prevention and control. Our patients often have the opportunity to take advantage of clinical trials not available at most hospitals. A revolution is happening in cancer treatment: we have cracked cancer’s genetic codes. We can now find out about your cancer at its most fundamental molecular biology detail, then we can target therapies that are dedicated to you. These treatments fight cancer while allowing you to feel stronger and healthier. At Smilow Cancer Hospital, we are on the cutting edge of personalized medicine. Patient-centered care means getting to know you: your priorities and your goals, and what makes you unique physically and emotionally. It means putting you at the center of treatment and giving you and your family a voice in the process. With this understanding, we can develop more a focused and more compassionate course of treatment. Patient-centered care at Smilow Cancer Hospital is grounded in dignity and respect, collaboration, active participation and support. We are taking the laboratory advances that are being discovered every day by our researchers, on how cancer cells communicate and grow, and bringing them into the clinic and advancing cancer care for our patients. With these advances, we are finding the right drugs that attack only the abnormal cells. By using technology to help specialists diagnose cancer earlier and successfully perform even the most complex procedures, we are transforming cancer treatment at Smilow Cancer Hospital. At Smilow Cancer Hospital at Yale New Haven, hundreds of specialists are changing the face of cancer treatment. From scientists to physicians to nurses, they are among the best at treating specific types of cancer. On any given day, teams of these specialists meet to determine the best course of treatment for a single patient. It is their expertise that is giving patients more effective options for overcoming cancer. The intersection of personalized, patient-centered care with the latest scientific advances is what is happening now at Smilow Cancer Hospital. Smilow Cancer Hospital provides the very best cancer care available, bringing together some of the nation's best minds to develop new methods to prevent, diagnose and treat cancer. 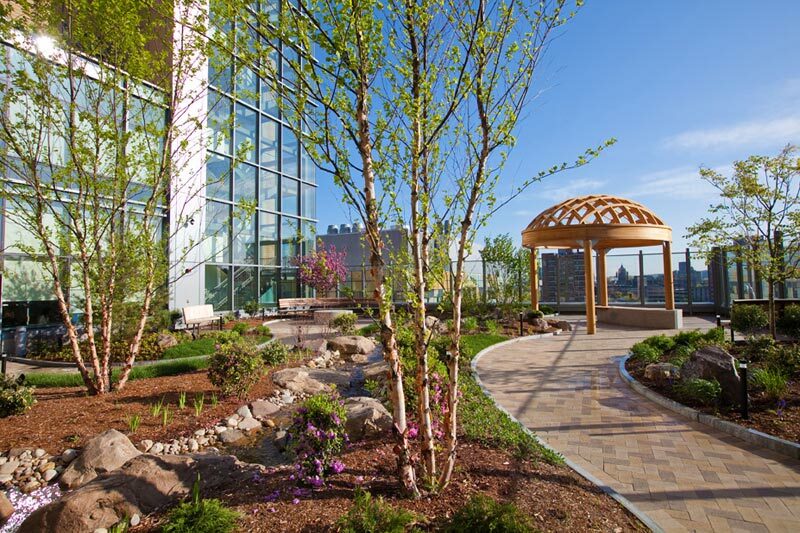 Some of Smilow's special features include a roof-top healing garden on the seventh floor - an outdoor garden, complete with trees, shrubs, plants, a small stream, benches and lovely views of New Haven. 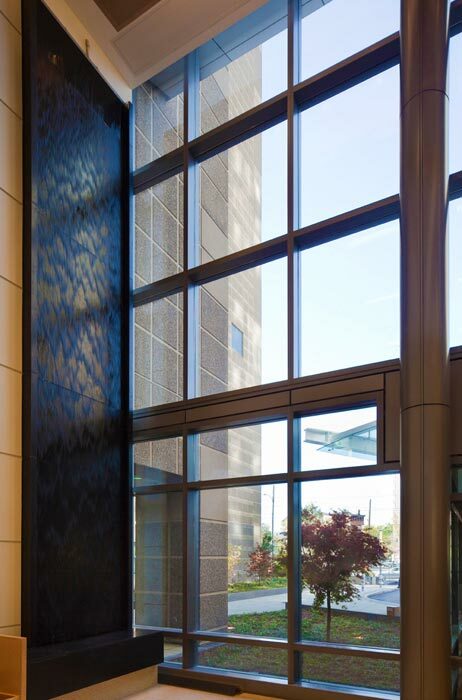 Smilow has a magnificent two-story glass lobby with a terrazzo floor, a granite waterwall, terracotta walls and maple woodwork. A special boutique will help patients look and feel better, despite their illness. 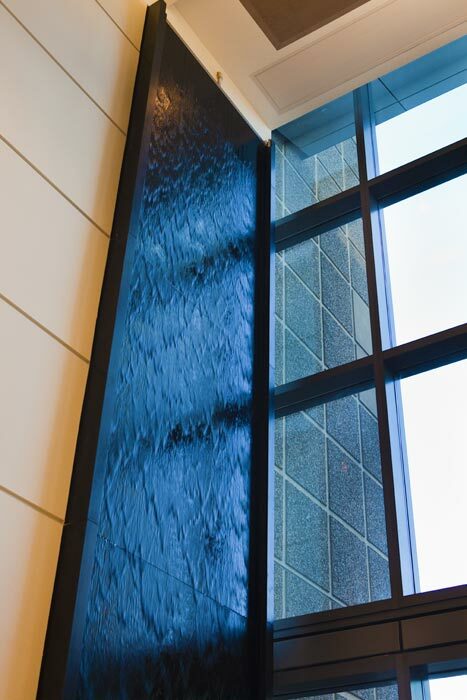 The building is named after Yale alumnus Joel E. Smilow (Yale College, '54), former chair, chief executive officer and president of Playtex Products, Inc. He and his wife, Joan, gave a major gift to support the cancer hospital. 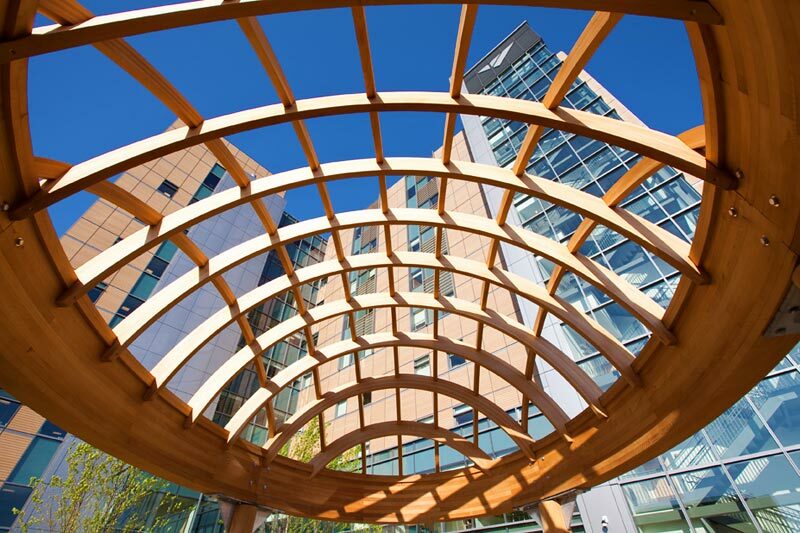 In addition to the comprehensive services we provide at Smilow Cancer Hospital on our main campus in New Haven, we also feature individualized and innovative local care at several centers around our region. 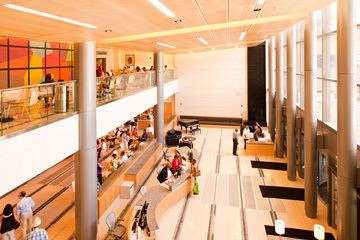 Tour Smilow Cancer Hospital at Yale New Haven, New England's premier facility for the treatment of cancer and research toward a world that is cancer free. Smilow: Bringing the world closer to free. 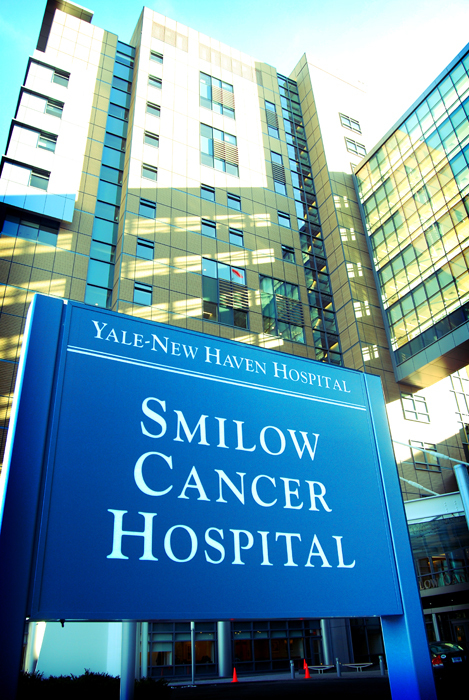 Smilow Cancer Hospital at Yale New Haven will continue to build on the rich scientific tradition of Yale Cancer Center. Yale Cancer Center is expanding clinical trials and developing a clinical program that will provide molecular profiling services to enable targeted therapies. In addition, Yale is creating a new cancer biology institute at its 136-acre West Campus in West Haven, CT, which will focus on research in the fields of cell signaling, cancer immunology and drug development, and target acquisition. 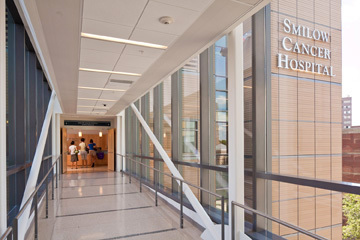 At Smilow Cancer Hospital at Yale New Haven, patients will find more than a dozen multidisciplinary cancer teams offering rapid access to appointments and tests, personal communication and assistance from a patient coordinator and personalized care led by a physician in collaboration with a team of specialists. Retinoblastoma is a rare type of eye cancer that usually develops in early childhood, typically before the age of 5. Yale New Haven specialists offer novel treatment options, tailored for each patient.